cubaguardalavaca.com | Want to know before you go? Official Cuba Guardalavaca information and guide, get facts and latest news. 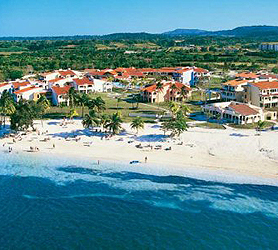 Posted in About Guardalavaca	| Tags Guardalavaca Cuba, Guardalavaca History, Guardalavaca Resort, Hotels in Guardalavaca, How many Hotels Guardalavaca, Things to do Guardalavaca, Total Rooms Guardalavaca, Why visit Guardalavaca? Posted in Where is Guardalavaca? | Tags Distance Havana Guardalavaca, Distance Holguin Guardalavaca, Distance Santiago de Cuba Guardalavaca, Where is Guardalavaca? Posted in What does Guardalavaca mean? | Tags Definition Guardalavaca, Guardalavaca Origin, Meaning Guardalavaca, Origin name Guardalavaca, What does Guardalavaca mean? 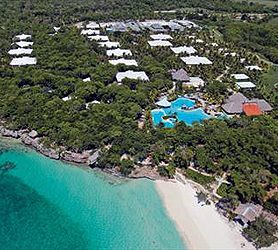 Hotel Paradisus Rio de Oro occupies an astounding 113,000 m² seafront lot. Offering unusually large Master Junior Suites with elegant Garden Villas, all with access to the private Royal Service pool and direct to the white sand beach. With Palapas strewn throughout the gardens and a tropical forest where the hotel is located, guests who love to vacation in a truly idyllic nature park would do well to choose the Hotel Paradisus Rio de Oro. The hotel has its own botanical garden and natural orchid garden which is great for bird watching and enjoying spectacular views of the blue lagoon and the tranquil sea. The Hotel Paradisus Rio de Oro also boasts of Melia’s trademark YHI-Spas’ however, this one features unique and private beach access to ensure even more exclusivity than other hotels similarly equipped in Cuba. The hotel features 1 and 2 floor bungalows and a the chic Royal Service area with new and elegant Royal Junior Suites, Deluxe Junior Suites with garden or sea views, Suites, Master Junior Suites with garden or sea views and Garden Villas, a truly ample array of accommodations from which to choose. Hotel Paradisus Rio de Oro is all about location. Just 4 km from the Yacht Marina Gaviota and enigmatic aquarium with dolphinarium, guests can also visit Cayo Saetia and Chorro de Maita very easily, both being a similar distance away. For those who love to shop, just 5 km away there’s a large shopping center. Ranked amongst the best equipped hotels in the area, Hotel Paradisus Rio de Oro also features a Beauty salon, fitness center, clubhouse, sports courts and water sports. Our booking process is unique because it shows the best rate from all of these for Paradisus Rio de Oro hotel in Guardalavaca and the types of rooms available. Our Paradisus Rio de Oro Guardalavaca rate comparison is an industry first for Cuban Hotels. Once you’ve compared the rates, finalizing the booking at Paradisus Rio de Oro Hotel takes just seconds and an immediate confirmation is provided in real-time. Brisas Guardalavaca is heaven on earth, the landscape contrasting colors turquoise seas and white sand. Snorkeling at beautiful reefs nearby will consume hours of each day. BRISAS Guardalavaca is a highly recommended hotel not just by us but also by guests who have also stayed here. The place is clean, food is great and the best beaches within short walking distance. Higher floors offer spectacular views but conversely of worse access. Your choice. You´ll be pleasantly surprised by the staff, the food and the BRISAS Guardalavaca resort itself, a large complex which also combines intimacy with a large array of activities and services. If you can afford it, stay in the villas as they offer large impressive surroundings for those who enjoy quiet days on the room terrace reading or soaking up the life below. We recommend a walk to the public beach close by to enjoy the local pizza restaurant (Paladar) which is delicious. The resort offers bicycles to go and discover the city which is an excellent afternoon out. The surrounding areas and resort are very safe and a perfect place to get away for a family vacation. The resort had lost of activities for youngsters; snorkeling, sailing, games room, tennis courts, etc. The resort offer surprising good food, excellent seafood and fish, fruits, fresh salads, vegetables and excellent meat variety. You can even enjoy the latest Parisian pastries or international delicacies. So, as summary, tasty food, 100% staff, amazing beaches, excellent accommodation and stunning entertainment will have you wanting to return to BRISAS Guardalavaca time and time again. Our booking process is unique because it shows the best rate from all of these for Brisas hotel in Guardalavaca and the types of rooms available. 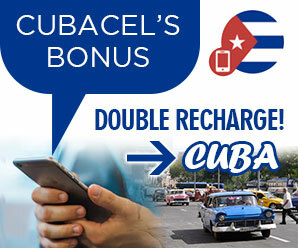 Our Brisas Guardalavaca rate comparison is an industry first for Cuban Hotels. Once you’ve compared the rates, finalizing the booking at Brisas Hotel takes just seconds and an immediate confirmation is provided in real-time. Club amigo Atlantico Guardalavaca is one of those hotels where the reviews vary immensely but do not do justice to the resort. If cost is high on your list of priorities this hotel offers excellent all inclusive value, an ideal location and idyllic beaches. The no frills food is of high quality and very fast. Perfectly acceptable menu variety with excellent service from the staff. The unforgettable days you´ll have at Club amigo Atlantico Guardalavaca turn into excellent nights when the entertainment team takes over offering amazing shows and an overall good time. The resort is divided into Standard rooms, Tropical rooms (better/newer), Bungalows and the very large Villas. Maid service and cleaning is excellent at all times. You´ll spend most of your time around the pools or on the amazing white sand beaches of the resort and, if you have kids, the entertainment team offers varied and educational entertainment for them. For singles or couples, there are secluded beaches close by and the beach is not too overcrowded. Most reports claim that the hotel should be should be four stars instead of three and we can certainly vouch for those opinions. The extra star easily goes to the amazing resort staff that is always attentive and smiling. Holguin City is close by and well worth a visit either by the novel speedboat excursion from the resort or the more common bus trip. There are plenty of bars to choose from in the evenings, a disco or the amazing night-time “beach party”. The disco is fun; the 24 hour bar offers a good time, beach party is a total blast. Overall, Club amigo Atlantico Guardalavaca belies its pricing, offering so much more for the money than hotels sometimes costing twice the amount, you´ll definitely come away with a smile and a minuscule dent in your bank account. Our booking process is unique because it shows the best rate from all of these for Club Amigo Atlantico hotel in Guardalavaca and the types of rooms available. 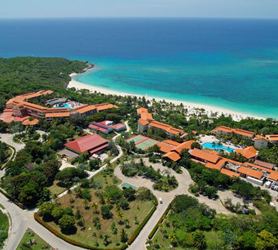 Our Club Amigo Atlantico Guardalavaca rate comparison is an industry first for Cuban Hotels. Once you’ve compared the rates, finalizing the booking at Club Amigo Atlantico Hotel takes just seconds and an immediate confirmation is provided in real-time. 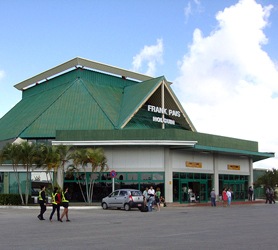 The nearest major airport is Frank Pais International Airport (HOG / MUHG). This airport has international and domestic flights and is 57 km (35 miles) from the center of Guardalavaca, Cuba. Another major airport is Carlos Manuel de Céspedes Airport (BYM / MUBY), which has domestic flights from Bayamo, Cuba and is 128 km (79 miles) from Guardalavaca, Cuba. Viazul Cuba Bus Service is the perfect option to visit Guardalavaca. For those of you who don’t wish to Rent a Car in Cuba the Viazul bus service will take you across Cuba and to Holguin in comfort. Once at the Viazul bus station in Holguin your trip to Guardalavaca is just 57 km (35 miles), costing little more than 35 CUC from the myriad of taxis available at the station. Viazul Buses are new air-conditioned models with onboard WC, central TV and lower suitcase compartment. Unless you intend to take the bus the moment you arrive, in most cases there is no need to book in advance as extra buses are added to routes when a particular route becomes overbooked. Simply visit the offices listed below, buy your ticket and travel either that day or any day in the future. The Viazul ticketing service is quick and efficient so usually you can collect a ticket in minutes. Departure times are clearly shown outside each booth. 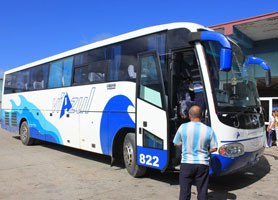 There is another bus service called Astro bus which visits Holguin but, although it’s cheaper because it’s charged in Cuban pesos (approx 24 pesos to 1$), the buses are less comfortable and are used by Cubans so they tend to be full on most journeys.